A receiving number is a phone number that we will forward calls to when someone calls your tracking number. It can be a mobile number, a landline, or the number for your call center. If you have a phone number that people are calling today, it can be a receiving number. This initial setup guide will create a receiving number in your account that you can use in your call routing. If you wish to configure additional options, review the Advanced Settings section below after saving your receiving number. If you wish to have this receiving number dial a SIP client, please see this article for more information. Navigate to Numbers → Receiving Numbers. If you do not have a receiving number in your account, you’ll be directed to create a new receiving number. Otherwise, click New Receiving Number in the upper right corner of the page. Enter your receiving number and optional description in the fields provided (use the drop-down menu to change the country code, if needed). Another easy way to add new receiving numbers is to create them from the tracking number settings page. If you wish to route your tracking numbers directly to one or more receiving numbers, you can use this method for easy setup. See this article for more information on routing your tracking numbers to receiving numbers. Navigate to Numbers → Tracking Numbers and click edit next to the tracking number you want to route to a new receiving number. Click or scroll to the Dial Routing section of the page. Use the drop-down menu to select Dial Receiving Numbers. Click + Add Receiving Number to add a new row to the list. Enter the number you wish to route calls to. If needed, you can add more receiving numbers to be dialed. Each number you enter here will create a new receiving number in your account. If your receiving number allows you to dial directly to an extension, you can configure that extension as part of the receiving number in your CTM account. If your phone system requires pauses between extension digits (for example, to navigate multiple menu options), enter a w character for each half second of wait time needed. For example, if you want to first enter a menu option of 3 and then dial the 1928 extension, you would enter 3ww1928 in the extension field. If you only need a pause before dialing the entire extension, you can use the “Dial Pause” drop-down instead. Navigate to Numbers → Receiving Numbers and click edit next to the number you wish to edit. Enter the extension to dial in the field and configure any delays needed. Note: if you’re not sure whether you need delays, try some test calls once your number has been configured. You may need to consult a phone systems expert for the receiving number if you experience issues. 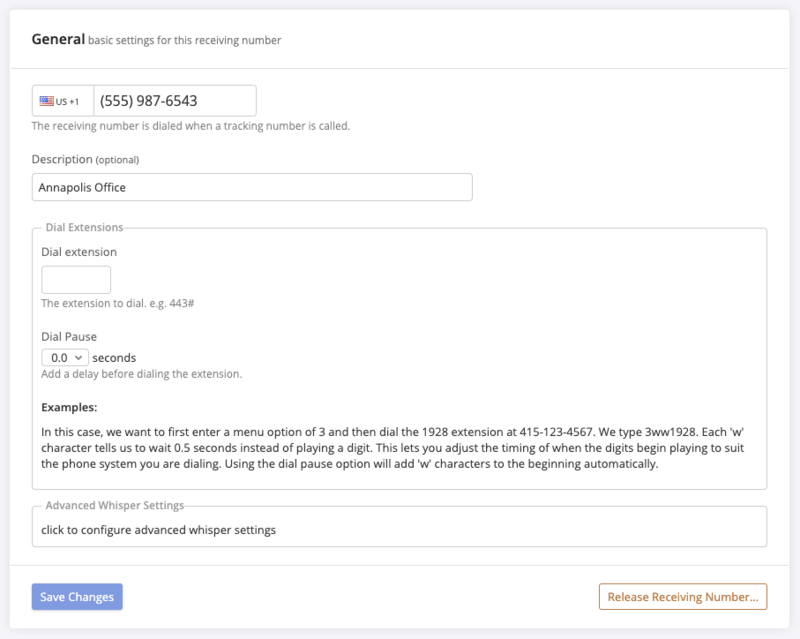 This section allows you to configure a whisper message specifically for this number. 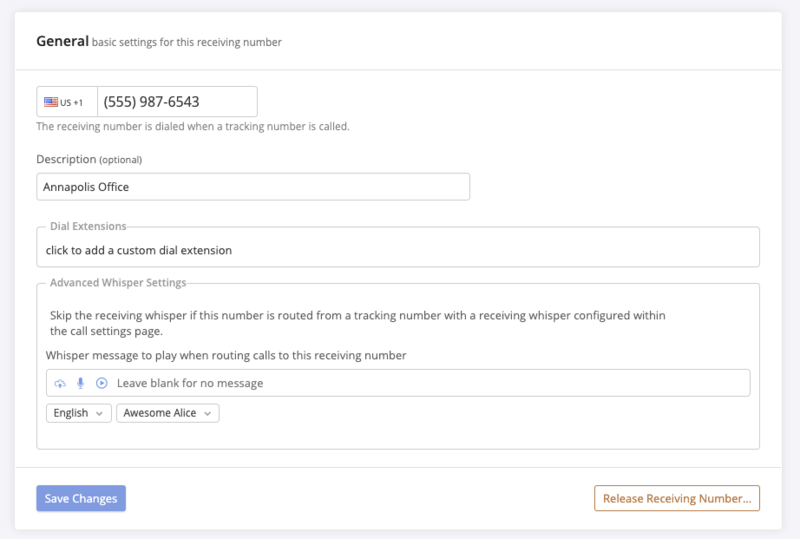 If there is a whisper message set up on the call settings configuration associated with the tracking number that routed calls to this receiving number, the message you set up here will override the message on the call settings. You can apply a schedule to this receiving number in order to control what will happen to your call route outside of the schedule’s specified hours. Note: if you have a tracking number routing to multiple receiving numbers, schedules assigned in the receiving number’s settings will not apply. For more information about schedules, see the full article here. Configuring no-answer routing allows you to control what happens to the call if the receiving number is busy or isn’t answered. Click or scroll to the No-Answer Routing section of the page. Select specific receiving number, menu, queue, or smart router that you wish to route to. If you haven’t created the routing feature you want to use, you’ll ned to do that and refresh the page in order to select it here. Next, choose how long you want the call to ring to this receiving number before the no-answer route is used. By default, this is set to 45 seconds. By default, no-answer routing is not configured (calls will hang up if the receiving number is busy or unanswered, unless the receiving number has its own voicemail that answers the call). 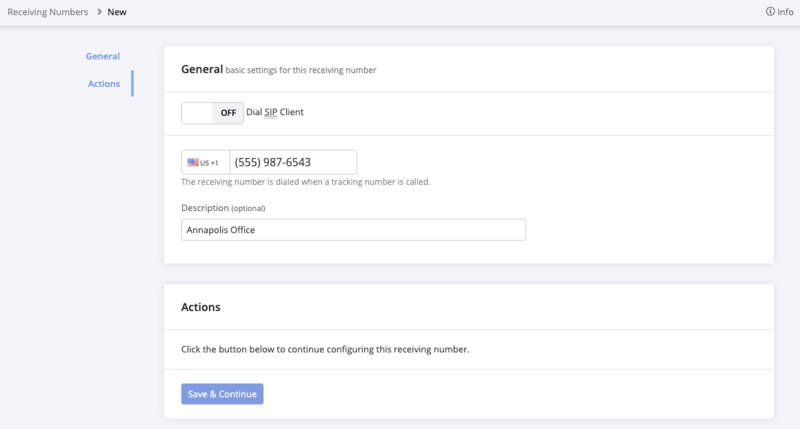 This section allows you to assign an agent to calls that are routed to this receiving number. If you are using the Salesforce integration, you can also use this section to assign a default Salesforce lead owner if an agent does not answer the call. By default, calls are only routed to agents when they answer a call from a queue or a call that is routed directly to the agent. If you are using automatic call tagging rules, you can set tagging hours by receiving number to have tags applied only during the hours you define in a schedule. Click or scroll to the Tagging Hours section of the page. Use the drop-down to select the schedule you wish to apply. The source tag field in this section allows you to append extra data to this receiving number for use with the CallTrackingMetrics API. If you are an API user and need to attach an additional field, such as an ID number, to individual receiving numbers, use this field to enter that information. By default, the source tag is not configured. This feature is only for use with the API.